It came and it conquered. Mahindra Quanto is the world’s first car to measure under 4 meters and seat 7 people. So do we need to say it is a success? It indeed is a very successful car. It comes at a price tag for which you can buy an entry level sedan, its top end variant is almost a lakh cheaper than its nearest rival, the Renault Duster and it can do something no car in the sub 7-8 lakh bracket can- seat the complete big fat Indian family. Mahindra Quanto has been a runaway success and the car’s waiting periods are shooting up even after the company’s ramped up the production. But due to the heavy weight of the car, it is not the swiftest of movers and those rear wheels sometimes tend to take too much of load. And to cater to this problem and lend it some off-road credibility, Mahindra is planning a 4×4 variant of the car which shall take care of all the issues and today we have some spy-shots for you as well of the top of the line variant, courtesy our friends back at MotorBash. The car was spotted doing rounds around Pune and was being accompanied by a Bolero to give it some cover which we believe did not really do the job of hiding it well. The 4WD badging can be seen on the front wheel hubs and another point worth mentioning is that the test mule was a 5 seater instead of the 7 seater that the Quanto is. As a result, the test mule did not have a foot board to get in the backseats. 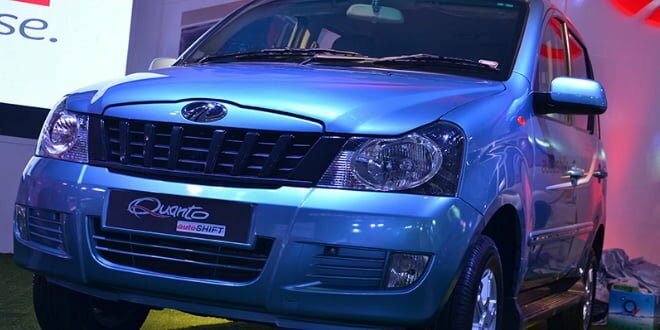 A story which still remains a speculation is that the Quanto might just get a bigger heart along with the 4 wheel drive option which powers the Xylo. But that would certainly increase the weight of the car tremendously, making it quite the slow poke when it would come to making the quarter mile dash. But how many of us actually have a heavy left foot. An Indian would like it better if he’s able to carry his world with himself easily, rather than zooming past the pole position when the light turns green.